In the week following Thanksgiving 1999, I bicycled 780km around the state of Tasmania, Australia. This page provides a few highlights and pictures from the trip. I recommend Tasmania as an good place for a one or two week tour as a break from winter in the Northern Hemisphere. Pretty scenery, an interesting historic past and reasonable roads make for a nice one or two week tour. The two maps used on this page were taken from the Focus on Tasmania web site, a generally good resource for further tourist information. Other resources I found helpful included Tasmania: Lonely Planet, Australia Guide and a guide book on Tasmania provided by Little Hills Press. Each of the pictures on this page have been provided in thumbnail form so that they load quicker. Click on any picture to see a full-sized version. It is a long way to Hobart from San Jose. Total of 29 hours between the time I packed and unpacked my bicycle. Left work about 3pm and bicycled to CalTrain. Took CalTrain to the Millbrae station and then carefully cycled into the San Francisco Airport. It was supposed to be the busiest travel day of the year (Wednesday before Thanksgiving), but cycling into SFO was better than expected and preferable to leaving my car for a week and a half in the parking lots. I did however decide to go during daylight rather than closer to my 11pm departure time. Thanksgiving completely disappeared this year. Soon after the plane took off, I fell asleep. I woke up almost across the date line and thus it was Friday already. Uneventful though a long 14 hour flight. After clearing immigration and customs in Sydney I was somewhat surprised to find that the local carrier Ansett had no record of my flight. "Talk to United, they are the ones that cancelled..." Fortunately, I was able to go standby and even bumped to business class. Unfortunately, my luggage missed the connection and arrived four hours after I did. Finally assembled everything about 5pm and cycled an easy 10km out of the airport to Sorell. Stayed at the Blue Bell Inn, a bed and breakfast pictured in the photo. Was the only guest, though they had a different cycle tourist the night before. It was nice to finally arrive and be in Tasmania! A beautiful calm clear and morning. It was summer here, 42 degrees south latitude and 16 hours of daylight. Sorell was quiet as I ate breakfast with a friendly orange tabby cat at the Blue Bell Inn. Winds mostly calm as I left about 6:30am. Picture on left is picture of typical farm landscape I passed through. Lots of sheep in the fields. Even when I passed by at 50+ meters, the sheep seemed to get startled by my bicycle and would go hurridly running away, of course causing other sheep to follow. Road was very quiet, took almost an hour before any car came by. After the first 10km or so, I encountered some rolling hills. Saw a marked summit at 296m for Black Charlie Hill, a descent, and then Bust-me-Gall hill at 336m. There were some nice descents following including Break-me-neck hill, before coming into Buckland. At Buckland, I stopped in at the local roadhouse for a breakfast, bacon & eggs along with a pot of black tea. Lots of tea in Tasmania. After Buckland, a few more rolling hills and then a valley following the river down to the sea. The mouth of the river was at Orford, a small resort type town. From Orford a few more rolling hills to Triabunna and a stop at the visit information center. The picture at right was taken at the harbor in Triabunna. Apparently, not as much activity fishing as before. Between Orford and Triabunna was a turnoff to the ferry to Maria Island. I didn't stop there this trip, but this is supposed to be a delightful old prison island, with remains of the old settlements and lots of hiking and exploring. Maria Island only served as a penal settlement for a short period as convicts found it easy to swim across from the island to the shore. From Triabunna quiet road and rolling hills heading up to Swansea. Little Swansport was the only named settlement along the way and it wasn't much more than a dozen houses. I stopped briefly at the "Spiky Bridge" pictured at left. Along the top of the bridge, rocks were arranged in upward spikes. It is now unknown what purpose this served, either ornamantal or defense or some other reason. This bridge and many other structures were built by convict labor in the 1800s. By early afternoon I was in Swansea. Decided to stop for a quiet restful afternoon. For a while, watched women's softball game as Buckley was defeating Swansea and then walked along the main street in town. Afterwards, dinner in town and quiet restful reading before turning in early. Walnuts, poppys, wheat, alfalfa, and lots of lots of sheep. These were the primary agricultural products along the east coast. While Tasmania is "The Apple Isle", there aren't many apples along this coast. Another quiet morning cycling along. Mostly flat at first with a reasonable sized hill at Cranbrook at 15km or so. After that some rolling hills before stopping for breakfast at 43km point in Bicheno. Bicheno is somewhat of a touristy resort town, but still not very busy. A few km past Bicheno is a wild animal park advertizing Tasmanian Devils, Kangaroos and other wildlife. Pictures above show some of the animals I found. At left is a small Tasmanian Devil. It was found in a cage with a label, "Baby Tasmanian Devils: We're friendly but we bite". The baby devils remined me a little of overgrown guinea pigs. There were also wombats and other critters for show. Wandering around the grounds, the Wallabee came up to me and was curious for a handout. Also saw a number of birds, both outside and also like these parrots in the aviary. When cycling through Tasmania, I saw some wild animals including Kangaroos and Hedgehogs; but even more of them as roadkill rather than live. After Bicheno, the road became pretty quiet, with no appreciable towns for 56km at Scamander. Still some rolling hills, lots of pretty views of the ocean along the way and some light cross winds. A fairly slow ride as I came through Douglas River, Seymour, Chain of Lagoons and Falmouth. I was getting a little hungry by the time I came through Scamander but was already past main parts of town before I realized it, and thus on further to St. Helens. St. Helens had a nice small harbor and a quiet main street. Early afternoon and a bit more sore than I would have expected. Picture at right shows an attempt at self-portrait of myself and bicycle using the large mirror in the motel room. The stretch from St Helens to Scottsdale was quite hilly, with a particularly large hill 28km from from St. Helens with many smaller hills along the way. Some of this terrain reminded me of Vermont with pastoral scenes, grassy farms and many small hills. Got off early with clear skies and cool tempertures. A few rolling hills past Goshen at 14km and then further to Pyengana at 26km. I stopped here at the roadhouse to get a breakfast before tackling "the hill". The proprieter apologized for not really being open yet (and being more of a tea house than road house). However, he was able to fix some scones along with a pot of tea for breakfast. The first three km the road twisted along the river before slowly climbing over the next 8km or so to >500m of elevation and over to Weldborough Pass. What goes up must come down and the descent from the pass down into Weldborough was quick and fun. Weldborough had a few small stores including one advertised as "the worst pub in Tasmania". Along the road were more giant ferns and other signs of rainforest and not as many farms. From Weldborough another delightful descent of 5km down Weld Hill and through Moorina. Didn't see much of this town other than their gold club. The next real town was Derby. From Moorina some further climbs up to the ridgeline before another nice descent into Derby. By then it was close to lunchtime so I decided to wait at the Derby Hotel as left until they opened at noon. Unfortunately, they never did so went to the mining museum with menu listed at right. In Derby they had mined tin for a number of years. Derby itself was in a narrow valley and had been nearly wiped out by floods in the past. Now a pretty quiet town. From Derby the road follows the river for a few km, before climbing up to the ridgeline and the quickly descending into Braxholm before climbing out again. After Braxholm, some further climbs and descents as I slowly crossed several drainages. All day there had been a number of log trucks passing. About 6km from Scottsdale I passed their destination, several large pulp and paper mills. I also passed the hop growing region. I was only able to tell they were hops by the signs posted and by the network of twine with red ribbons overhead (to keep birds away?) of the plants. At Scottsdale I found the motel. The proprieter wasn't in, but there was a cool place to wait in the lobby. The proprieter couldn't understand why one would bicycle in this hilly region and also with the amount of road kill on the roads (in my opinion not too much). Scottsdale was a typical small town. One thing I noticed was a prevalence of take-away shops with warming bins of food or otherwise quick bites to be sold. These seemed to take the place of small restaurants in many places. Today was a study in contrasts with three major regions to bicycle through. First third of the route was a continuation of the hilly region with quiet roads, wine grapes and many climbs and descents. Middle segment was crossing the city of Launceston on major city streets and highways. Last third was open plains, mostly flat roads and wide open spaces. From Scottsdale I took the backroad via Lilydale rather than the main route A3. This partially because I had a guidebook description of this route and partially since I figured it would be even quieter. A quick descent from Scottsdale followed by gently rolling hills. Mixture of cows, sheep, pasture, and some forests. After 18km at Golconda there were signs for large lavender farms (the largest outside Europe) about 3km off the road. Following this, the hills started becoming steeper with a number of vineyards in the area. I didn't quite figure out that "Cellar Door Sales" meant sales of wine until the second or third place I came by with this sign. At 32km on the backside of Lebrina is a steep hill followed by a sharp descent. Some of the descent was gravel as there was roadwork in this section. From Lebrina a steep climb over the next hill and another descent into Lilydale. Lilydale was my morning breakfast+ stop. No tea house or restaurant but a crossaint, apple, snickers and coke from the supermarket would do. Somehow it seems that everywhere 600ml of coke is A$1.80 regardless of where it is purchased from. Gasoline is ~A$0.80 per liter or a little less than $2/US per gallon. After Lilydale the hills moderated some before reaching Rocherlea and the outskirts of Launceston. Launceston is the largest city in the north at ~100,000 people and thus also a regional center. The road got pretty busy with two lanes each way. Fortunately some of this with a wide emergency lane on the left. Climbing out of Launceston the road was two lanes each way with 110km traffic. A fairly long climb up into the highlands and then much flatter after that. ~20km from the city is a turnoff to the airport and after that the road becomes two lanes again. It was a hot day. 35 degrees celcius, which is also hot for Tasmania. As I was cycling along I would periodically stop in the shade. Fortunately in this stretch the road became much flatter. Amazing how much quicker my pace would be without the hills. In many places, one could see across broad stretches of grasslands to hills further away. Traffic was still pretty light. I stopped in Epping Forest as a roadhouse for lunch and then came into Campbelltown not too much after that. Picture at left is "The Grange", a neat old building and now also a B&B. My room was the one with a single window. Talked a bit with the owners about tourism. 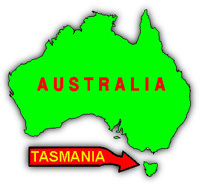 Tasmania has a little less than 500,000 people and a little more than 500,000 tourists per year. About 85% from Australia with the remainder primarily from Japan, UK, USA and western Europe. "Green Tourism" is a big draw with large portions of the west designated as park lands. I didn't see many other cycle tourists, though there are some in groups. Campbelltown itself had a nice wide main street and then several historic structures, two churches, a large bridge, the grange and other places. Again more places with Take-Away food than sit down places for a meal. Weather forecast predicted rain on 2 December, so decided to get back to Hobart today. In advance of the front, there were some delightful winds from the north, tailwinds. After 11km, took the turnoff to Ross, like Campbelltown, another historic town in the midlands. Picture at left is their monument to WWI victims. This town had fewer WWII casualties than WWI casualties, but I think this is likely because Ross was losing population and not because less Australians died in WWII than WWI. Ross also had a wool center, a historic bridge and several churches. It was still early when I came through so not much was open. After Ross, the road continued pretty flat with overtaking lanes every 6km or so. It was mostly flat for the next 30km or so, though at the end of this stretch the road slowly climbed up to St. Peters Pass. Just before the pass was a small park where I found shrubs that had been sculpted into different types of animals: rabbit, chicken, dinosaur, etc. With the hill it was a good excuse to stop. After the park, crested the hill and had a nice descent with tailwinds coming into Oatlands. Oatlands was another historic town with tile sidewalks, grey buildings and others that looked a bit european. Oatlands was an excuse to find mid-morning brunch. After 10km from Oatlands, I saw a turnoff from A3 to a smaller road that went via Richmond. On a whim, decided to take this road. The road itself had numerous potholes. Fortunately, very little traffic so I could easily pick my choices of where to cycle. Road was initially pretty flat, but then crested a hill was a fun descent into the town of Colebrook at 19km from the start. After this another climb and then slow rolling hills to the town of Richmond. Bridge at left is the Richmond bridge, oldest bridge in Tasmania. Richmond is also site of the oldest Catholic church. Richmond itself had a feel to it as a somewhat expensive and touristy town. A local school had unleashed a busload of children with assignments to complete by stopping at the tourist stops in Richmond. I stopped for lunch in Richmond. Awnings outside were taken down due to the winds blowing through. After Richmond some more winding roads. Still wind, though less of a tailwind. I came back to the main road at Cambridge and then followed the main road in to Hobart. I came by way of the Hobart Bridge. I mostly walked across the bridge along the narrow pedestrian/cyclist access. After crossing the bridge I was on the incorrect side of the road, so I mostly walked along the road for a km or two before making it into the center of town. From here found a nice B&B close to town (Gattonside), did laundry and otherwise relaxed. Rest day in Hobart. It was supposed to rain today, but the front was slower and didn't come through yet. Hobart is a town of ~200,000 people with a number of nice squares. There was a large museum, Antartic Adventure, that told all about Mowson's explorations and also about the three bases Australia had established in Antartica. I also went to the planetarium show and got myself oriented to the southern sky (e.g. southern cross, pointer stars, Orion being upside down...). I watched a chess game in the park. I visited the art museum. I walked along the main shopping street. I saw this boat at the wharf with many electric lights. Apparently a squid boat as squid are attracted to bright lights in evening. Otherwise, a quiet touristy day before retiring to Islington guest house (Gattonside only had room the first night). 3 December; Hobart to Port Arthur, 100km; who is afraid of ghosts or rain? Today I cycled to Port Arthur at the tip of the Tasman Penninsula. Got up nice and early and got across the bridge and into the airport by early morning. At the airport I stashed some of my gear in a locker. In the locker went extra clothes, most of the books I bought along the way and other heavy stuff. After the airport, some winding roads into Sorell and then quieter traffic as I went down the roads to the Tasman Penninsula. Skies were overcast with an occasional teaser with a few drops of rain but nothing too serious. I was going reasonably quickly across some gentle ups and downs. Past Forcett, past Copping and Dunnalley. All the time thinking I wanted to beat the rain if it came. This route had some gentle climbs and also several nice descents. After Dunnalley, was onto the Forestier Penninsula. A gentle climb and descent into Murdunna. This area looked like it had many vacation homes. After Murdunna a long climb, slowly winding for several kms up out of town. Just before Eaglehawk Neck, I discovered this climb would be repayed by a steep 2km descent onto the neck. From here a gentle road going around the edges of the Tasman Penninsula, past another wild animal park. This area was getting a bit touristy with advertisements such as Convict Country Bakery. I was able to make it into Port Arthur by noon. Port Arthur was site of a large prison that was open between 1830 and 1877. The site has a visitor center and allows tourists to stroll the grounds looking at various ruins. Tasmania prison history is somewhat interesting. In the early 1800s, Great Britain was undergoing a number of changes: the napolionic wars were over meaning less soldiers, the industrial revolution was starting with mills and new ways of working. All this meant a change in society and for some a "crime wave", many of them lower class people convicted to stealing simple things such as thread, bread, boots, etc. Great Britain decided to address some of this crime problem by commuting some less severe sentences to "transportation". This meant sending the convicts half way around the world to Australia where they would work for 7, 14, 21 years or life to work off their sentences. Some 175,000 people were transported to Australia. Of these, about 75,000 ended up in Tasmania, so this was a large influence on the island. Port Arthur was opened in 1830 as a prison where convicts were sent if they committed a second crime after being sent to Australia. This included both convicts held in cells and others who just worked in the area clearing bush, creating roads, etc. By the mid-1800s, GB decided to stop transporting new prisoners, so the population slowly aged before the prison itself finally closed in 1877. After closure there was a bit of a stigma on Port Arthur. They renamed the place Carnorvan and otherwise let the prison grounds fall into ruin and also be ravaged by bush fires. However, in early and mid 1900s, the government was able to acquire back the grounds and set it up as a park. From there it became a tourist attraction and is a popular destination now. The front came through about 3pm and it rained. It rained hard with gusting winds. From 3pm until 7pm as it kept raining, I hoped this front wouldn't be too long as I kept watching the weather outside. Pictures at right shows the main prison grounds both before and after the rain came through. Picture at left shows the old church and some of the other ruins. Fortunately, not long after 7pm it started clearing up. In the evening, I took a "Ghost Tour". This is a fairly popular tour using candle lanterns and kerosene lanterns to walk through the grounds of the prison while guards tell scary stories and do minor things to startle tourists. It was fun. Following this, looked up and saw thousands of stars up in the clear skies. Fortunately the planetarium visit helped me identify some of the constellations. Last full day cycling. An easy day. I slept in, had a quiet brunch and then stopped at the visitor center before departing. From there I cycled the 70km back to Sorell. This is the only stretch of road I did both ways and it was interesting to see the contrasts of where I used to zip downhill I now needed to slowly climb and vice versa. Saw a hedgehog trying to cross the road. It got caught in traffic and unfortunately the normal defense posture of curl up and put out the spikes wasn't the best choice. Fortunately, the cars were able to avoid it. On the way back, I stopped briefly at Eaglehawk Neck. This narrow neck to the penninsula is the only entrance. They used to put ~25 dogs on a line to detect escaped prisoners going past. To keep them further in line, they told them waters were shark infested. One enterprising prisoner almost got by wrapped in Kangaroo skins and hopping past, until he was almost shot and gave up. After Eaglehawk Neck, I climbed up the old road. Stopped briefly at the signed for Tesselated Pavement. This was a set of rocks with many horizonal and vertical cracks, almost like normal pavement with tiles. From there a slow climb up the hill and then descent past Murdunna before stopping at Dunalley for lunch. The Dunalley hotel was also a betting place, with satelite horse racing and also keno. I saw a few signs for TasKeno. Interesting to see if this is a major source of revenue for the state. After Dunalley, some slow hills and winding roads before coming into Sorell. Fortunately, the Blue Bell Inn had room. First night and last night in the same place. Awoke early and cycled the last 10km to the airport. Retrieved my belonging from the storage locker and had breakfast. Bought a bicycle box from Quantas. Discovered that the Quantas boxes are smaller than United boxes so both wheels needed to come off. Tried to bend the fenders out of the way as best I could. Uneventful flight to Melbourne and then Sydney. Arrived Sydney about 1:30pm and was surprised to see no listing for San Fransicso. Went to the United Los Angelos flight and discoved that SFO had departed at 1pm. Oops. Apparently, United must have rescheduled and then my travel agent (Travelocity) didn't inform me. I also hadn't rechecked the flight. Oh well, went via Los Angelos instead. From there a hop back to SFO and reassemble the bicycle. Arrived at SFO a little past noon local time. My bicycle came on the next flight. The front fender was a casualty, it would need to be replaced. Otherwise assembled everything and came back via CalTrain and cycling to be back at home by 4pm or so. Overall, I had a wonderful trip. The long 16 hour days in the middle of (northern) winter were nice. Tasmania is mostly quiet and rural. An ideal place for a bicycle tour, particularly with towns not too far apart. There are a few steep hills, particularly in the northeast and also (I hear) in the west. I would come back here for another trip. Of course, likely to do the western part if I do. Pictured at left and right are two wrapup pictures. One a reminder of some of the shorter hills and at right a slight self-portrait taken in the reflection of taking a tourist picture at St Luke's church in Campbelltown.